Pink is never getting too old or behind the trends. With the various hues, it might bring absolutely different mood to any room. Still, whether cotton candy or powder pink, wisely mixed with the metal and mirror accents, and with creamy, crispy white or misty grey walls, at all accounts it appears the spot-on piece. ‘La Vie En Rose’ makes the house stunning, and it all becomes real with the Meridian Furniture. Get inspired and stay informed about the fresh trends with the FurniturePick every single week. Give dinners for guests in a stylish spot painted pink, relax and unwind with Elle Dining Room Collection. Velvet is a claim to fame of the Meridian Furniture, not only for dining room sets. Pink is definitely the color worth being used in soft to touch and comforting fabric, like velvet. Being fresh by nature, pink is ideal when rearranging the furniture set and renovating your good old house. Pink is suitable not only for princess-inspired bedrooms for little ladies, but it is getting popular both in contemporary and traditional decorating. Just a couple of decades ago, when thinking of a pop of color, usually orange, red or emerald has been meant. For the last years the trend wave has been caught by tender pastels such as pink, coral, aqua, complemented by the white and other accenting neutrals. Designers tend to add those pink splashes by means of accent furniture here and there. Meridian in its turn, makes it possible with all the 50-shades-of-Pink in their collection of accent chairs. Feminine bedrooms are welcoming soothing pink colors. Opt for beds from Aiden Collection, Candace Collection for a simple minimalism or repressed style, with no sacrificing the charm of the tone and furniture design. Whether you feel like you need more – check the stunning Rosie Bedroom Collection and elegant and eye-catching bedroom from Flora Collection by Meridian Furniture. When redecorating, one might wonder what are the key matching colors with the pink hues. The warm pink color coordinates good with colors one would not usually expect to pair with pinks, such as dark brown, navy blue, charcoal. Powder pink or pale pink can be paired with sage green, deep brown, and cream tone for a soothing and natural color scheme. Don’t miss extra opportunity to use this color with a good amount of metal-and-mirror details. Pink becomes as a gem in a shiny frame. Your little baby girl is growing with every new day and time flies. She Is no longer an infant and she becomes a little lady, but still remains a playful girl and loves all the plush toys and princesses. Does your little treasure try the stunning, but still huge, mommy’s shoes and accessories on her? Does she try to look and dress up like a little damsel? It’s the right time for a little girl’s bedroom grow slightly with her. A room with the feminine touch, that will show that she is not a baby anymore. Furniture Pick team gives you today few ideas that might work for your little miss. Introduce the sombre colors! No denying that little girls adore all shades of pink, but it’s not obligatory to make it look like the bubble-gum kingdom. Neutrals, lavender, coral pink, white and gray set will give enough options to “play” with accessories. Add a floral touch or geometric patterns for contemporary style. Upholstered beds and furniture with curvy and ornate details will do magic and make it a girlish kingdom. Is she a beauty queen? We bet! Then don’t forget to add a vanity with mirror and couple of awesome pieces for storage, like hutches and desks, armoires, chests and dressers. Altogether with the graceful bedroom and nightstands they complete the whole picture without sacrificing functionality. Another great idea that might work for your little lady – the contrast color scheme. Dark and white together with the extra color that she loves, say pink, looks great and stylish. Moreover, you can easily change an extra color to add a fresh idea (like season color change) or when your daughter decides that she is too grown-up for pink. If she is of an age inbetween the small girl and teenager – she absolutely is out of the time for princesses and cartoons. Does she fancy glamorous stuff? Or maybe Parisian chic makes your little girl happy? Do not hesitate to ask your treasure about the preferences and what she’d love her room to look like. Add some throw pillows or bedding conforming to her tastes and “Voila!” – your daughter has a dream room. If you have two of the princesses sharing a bedroom, give each a space to have their own feminine style and decide altogether about the view they’d love to see in the room. Would the girls love to match or personalize their part of a room? 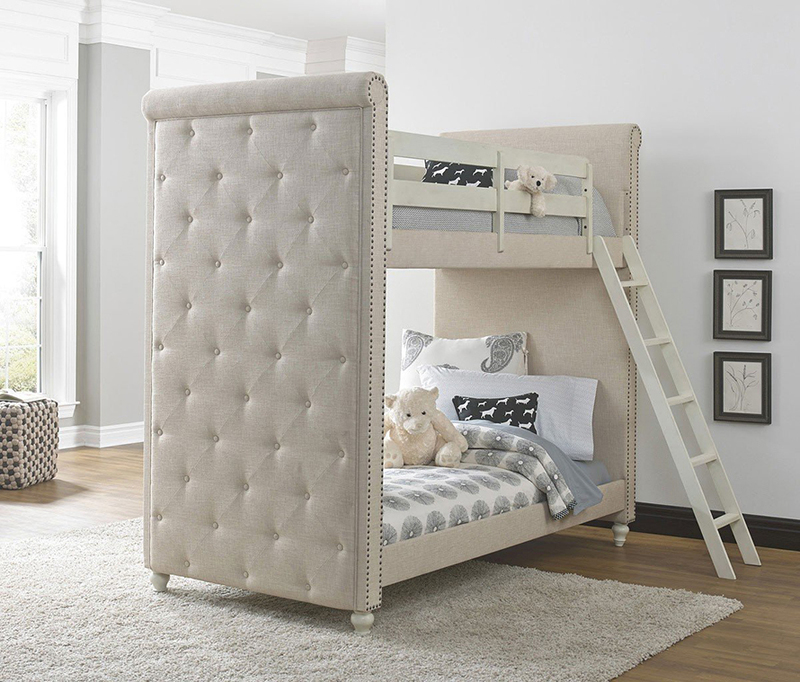 Whether you are short of space – you can always use the benefits of the bunk beds but still stay sophisticated and jaunty in the feminine look. We hope, our today’s article was helpful for your new challenge with decorating a room for a young miss! If you are interested in more kids and youth bedroom styles – you are welcome to visit Furniture Pick and find out even more ideas.